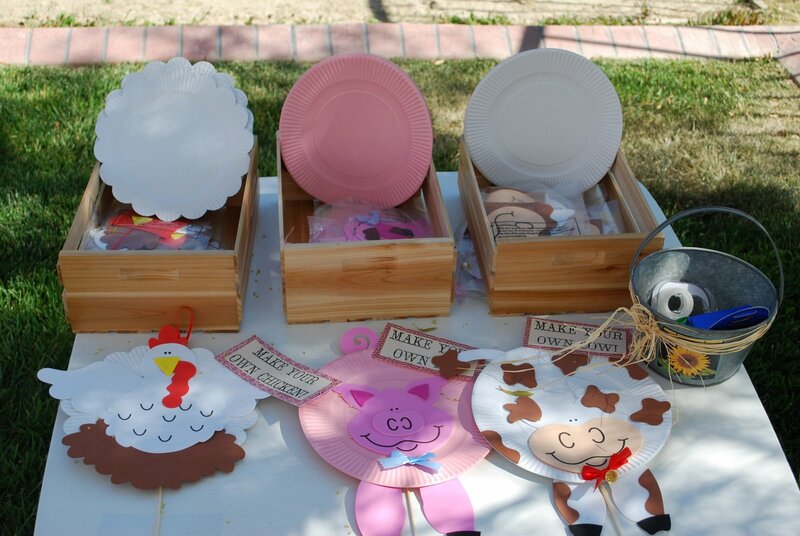 If you are thinking about having a Barnyard Party theme for your child's first birthday, you might just want to sit back and check out some of these amazing ideas! The cow cake is very cute, be sure to check out the post here to see the pig cake as well. 2. Here is another post by Hostess with the Mostess, it's a cute take "colorful" take on a barnyard party! It's amazing how a little yellow bow on the water bottles can add such a big impact! Now, this is what I am talking about, simple foods displayed in a great way = very cute! Love these for a favor! Use baskets when possible for a barn theme, simple and easy and you can always barrow them from friends/family to keep costs low. 3. Here are some pictures from a Barnyard party that I put together for a very special little girl who was turning three. I used hay for seating for the kids, they loved it and it really add's a bang to the theme. The glasses are actually starbuck coffee jars that I washed, they make great glasses! these "ponys" I made from felt and I was able to make each for less than $3. These are great to make as a favor for each kid to take home. I am a HUGE fan of giving favors that kids will actually use and not wasting money on trash and trinkets that are just going to get thrown away once the child get's home. Very cute craft to help keep the little farmer's busy! I think the cow bell is such a cute touch, I LOVE it, but then I began to think, what is the child going to do with a cow bell beside's drive his/her parents crazy? But it sure does look cute!